my fiance and i have walked by this place many times and dreamed of opening a pizza parlor specializing in very fresh ingredients, many of which we could grow in the sunny little yard behind the building. I drive past this all the time and wonder what the heck is going on. Why hasn't this cutie pie been snapped up and renovated. What a shame. Great location. My favorite building in Durham also - love the faded Durham Bulls paint scheme. This place has not been renovated probably because of the speculative market in the neighborhood. After the MiLB moves in, that corner's value is gonna jump. this building and the catsburg building are two of my favorites. their lazy owners deserve some scorn. I live in the vicinity, and I have always walked by this place and had dreams of turning it into my lil neighborhood diner, I absolutely hate seeing such a great building fall into the ground. Incidentally, I'm eager to see what you turn up as you inch into the residential blocks of OND! I have often dreamed of turning this adorable little building into a photo studio. So sad that it's just going to collapse from neglect. A number of developers, some very persistent and with very deep pockets, have tried very hard to get their hands on this building, to no avail. As I understand it, some buildings that don't sell in the area have decent excuses -- joint ownership by feuding estate beneficiaries, bankruptcy proceedings and liens, and what not -- but this one is apparently just a really stupid owner. My quick online research indicates that this property is owned by M M Fowler Inc, located at 4220 NEAL RD, suite 2000. This company is listed as the owner of at least 50 different commercial properties in the county tax record database. Mostly gas stations and convenience stores. The owner of M M Fowler seems to be Mr. Marvin L. Barnes, who resides in a million-dollar mansion located 3616 Hathaway Rd. Mr. Barnes appears frequently before the Board of Adjustment to request zoning variances on behalf of M M Fowler Inc. It seems to me that this is the logical point of leverage for the city: "Mr Barnes, either fix the following properties, sell them to someone who will, or don't bother asking for any more zoning variances." Either that, or a concerted campaign to boycott the retail locations owned by M M Fowler Inc. Ya gotta make a business feel the pain in the wallet. Nothing much else matters. Am I getting senile, or did you add another picture to this post and the one on the Texaco/Sinclair station after the original posting? If you did, can you please alert us when you do that. I don't want to miss any of your pictures. Thanks! Every time I see this building, I am frustrated by what COULD be. A store, a restaurant, a bar. I only hope that the owner will have a change of heart before it's reduced to a pile of bricks. I did add pictures - I actually do this not-infrequently with past posts as I find new pics. I've always considered the update each time I do so as kind of obtrusive (since unless I delete it, the "look at the new pic" lives on with everything else) and an extra bit of work. But thanks for letting me know that it might be of interest, and I'll consider it. Maybe you could just add a comment: "Added new picture, June 19--GK." or something like that. I check out the comments list, and I know other people do too. You work hard enough on this site, and I'm not trying to make it too onerous, but I really enjoy seeing new stuff when you post it. "Mr. Barnes appears frequently before the Board of Adjustment to request zoning variances on behalf of M M Fowler Inc. It seems to me that this is the logical point of leverage for the city: "Mr Barnes, either fix the following properties, sell them to someone who will, or don't bother asking for any more zoning variances." Either that, or a concerted campaign to boycott the retail locations owned by M M Fowler Inc."
Is there a way for the Board of Adjustment to attach these sorts of strings to a variance? If there is, does anyone know how we might go about persuading the Board to do this? Failing that, is there a listing of all Fowler businesses of which we could organize a boycott? It looks like the new owners of this property have decided to tear down the gas station - I noticed bulldozers and other heavy equipment parked there last night. Any ideas about what's planned for this property? Good news! 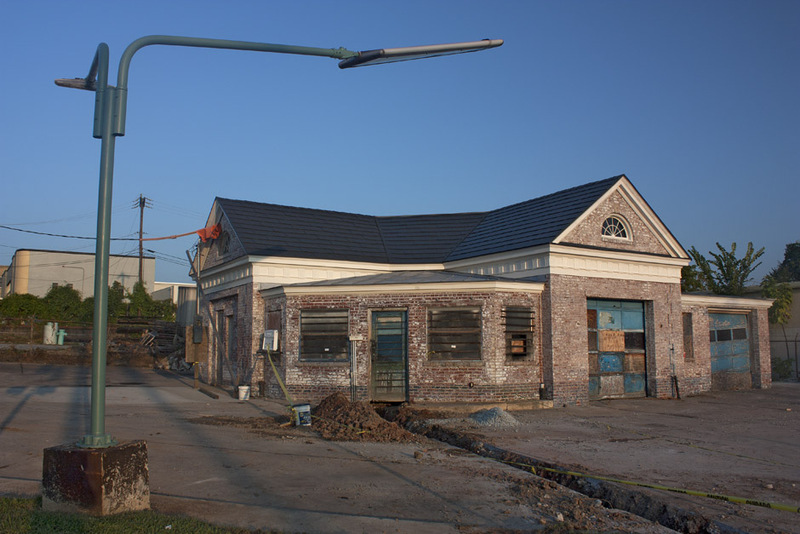 My wife stopped and got an update from the people actually working on the old gas station, and it's apparently NOT in danger of being demolished. No explanation for the bulldozers being there, but they were gone as of last night. Backhoes we're used to remove an old defunct hydraulic car lift from one of the bays. Is this Gulf station behind the old Durham Bulls ball park? Yes, this is said Gulf station - just about directly opposite home plate of the DAP. The outdoor patio area (behind the building in the views shown) was reworked in the summer of 2013 and now nearly all of it is under roof; it is most of their seating. Looking east from the west side of Foster Street, 08.03.61. Perhaps oddly, the small former Gulf Service Station on the southeast corner of West Geer and Foster St. is one of my favorite buildings in Durham. 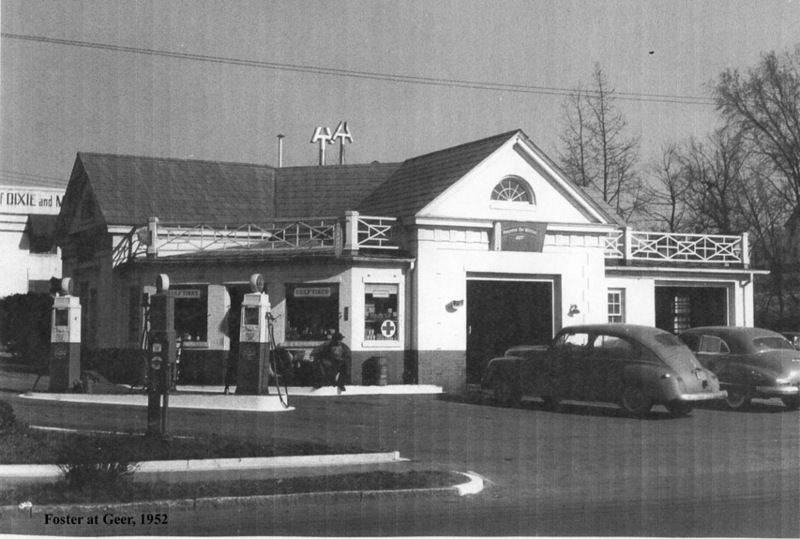 Built in the early to mid 1930s, the service station was certainly operational through the 1970s. But it has certainly been abandoned since awhile before I first became aware of it in the late 90s. 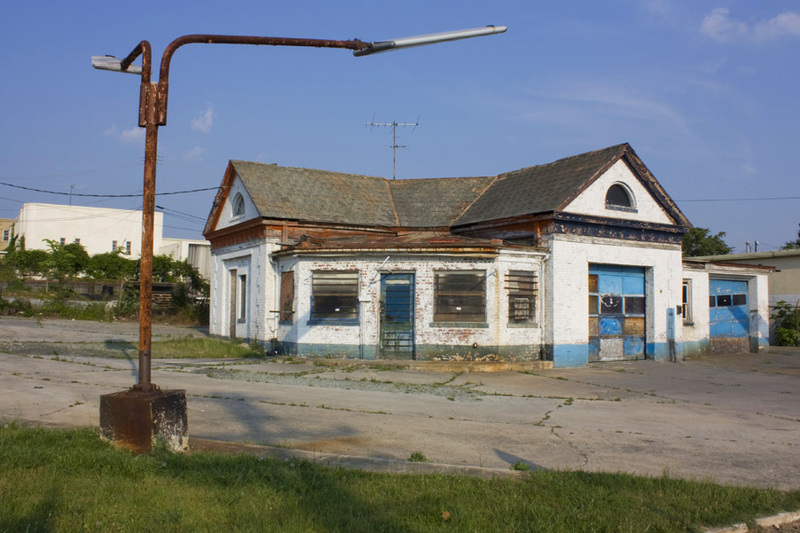 It demonstrates a kind of gas station architecture that I've noted previously - particularly with regard to the Pure Oil stations of the 1920s-1930s - often small stuccoed structures with details more reminiscent of a small cottage than what we think of as a gas station today. As such, this little building, though badly bedraggled, has great potential to be any number of uses - restaurant/coffee shop, bike store, comic book shop - whatever. It has enough charm - obvious even in this advanced state of disrepair - to pull it off. Unfortunately, the building is owned by MM Fowler, whose family I believe owned all of the Gulf franchises and distribution in Durham. This is one of several great buildings that he is allowing to fall into the ground for no good reason. Others include my second favorite old gas station in Durham, on Angier Ave one block east of Driver St., and the Catsburg Store. I attempted to contact Mr. Fowler years ago to see if he would sell this through Preservation Durham, but he never returned phone calls. I know other folks have tried too. Which is unfortunate, falling into the Fieldsian/Fireballian/Sturdivantian category of property owners that would rather see buildings self-destruct in the middle of their community than provide them with a positive future - through their own means or by selling them. I really can't find anything good to say about their 'contributions' to their city, and their seemingly irrational and antagonistic posture to their fellow Durhamites earns nothing but scorn from me. Amazingly, this building has been saved from the MM Fowler dereliction, and is currently being renovated by Bob Chapman. It will house a beer garden by late spring of 2011, called "Geer Street Garden, " helmed by Andy Magowan of Fowlers/Federal/Piedmont local culinary heritage. As of May, 2011, the "Geer Street Garden" is open; it was a thrill to eat on its back patio, having watched with sadness for so long as this building deteriorated, and having very little hope that it would survive. Kudos to Bob Chapman and Andy Magowan. 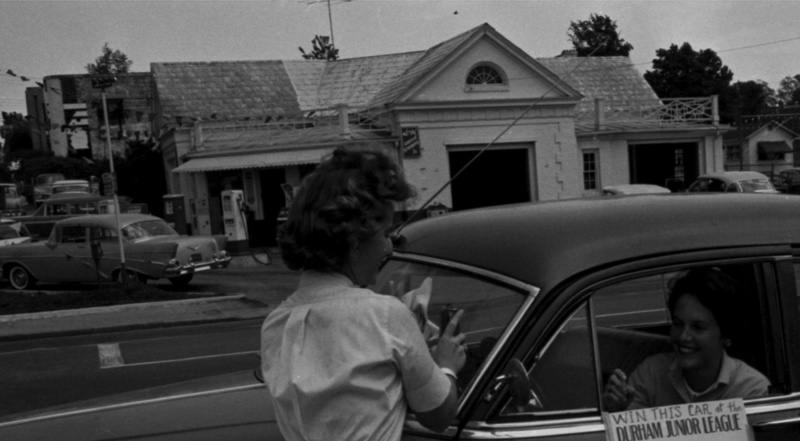 Fletcher's Service Station was constructed at the southeast corner of Foster and W. Geer streets by 1947, when it is listed in the 1944-1947 Durham City Directory as “Fletcher’s Service Station.” The station is not listed in the directories again until the 1960 directory when it is listed as “Fletcher's Gulf Service.” The Colonial Revival-style design features two intersecting pedimented gable wings, with a lower, hipped-roof office section in the center and a main entrance facing northwest. Walls are one-to-five common bond brick walls with quoined corners. Each pediment has a wooden fanlight and wooden cornices. A prominent wooden classical frieze with triglyphs extends around the gabled portion of the building. Each wing contains a service bay: one is now infilled with brick, the other has a replacement glazed wooden door. The front office section has a central replacement door and a pair of fixed single-pane windows on each side. Across the roof is a Chippendale balustrade, reproduced from a documentary photo. A third pedimented wing extends to the south side; an original flat-roof section beside it has a glazed wood auto bay door, a single-pane window, and a Chippendale balustrade. The rear (west) elevation contains two doors and three windows, one enclosed. 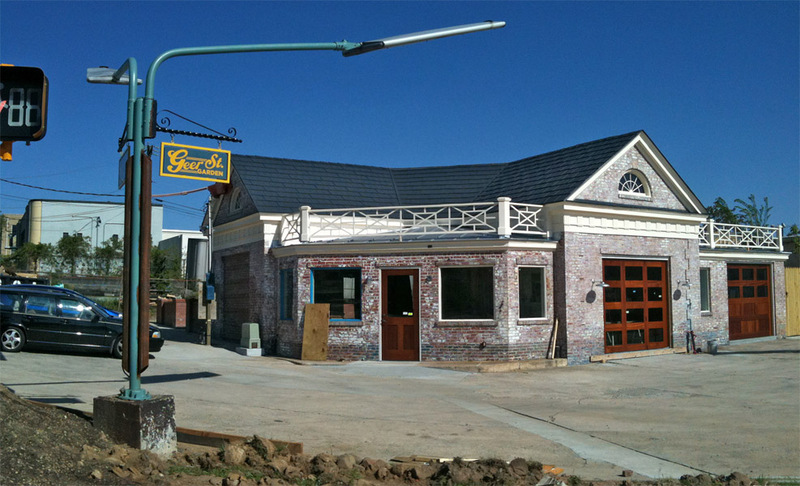 The old gas station was rehabilitated into a restaurant named Geer Street Garden several years ago. Its Colonial Revival features were restored and, in the case of the roof balustrade, reproduced in kind from old photos. The classical frieze was largely restored and the fanlights had survived intact. To the rear, a low brick wall encloses a dining patio, part of which is sheltered by a wooden and fiberglass free-standing porch. At the north and south corners of the paved parcel stand tall metal light poles of 1950s vintage. The building owner carefully restored the station's original architectural finish. No additions were made to the building, and it retains a high degree of architectural integrity.